So you have an event planned, great speakers and a fantastic venue. However, you just aren’t shifting those tickets. A few weeks ago a friend asked me to help with some ways they can get word out and pick up sales and I suggested a few techniques. 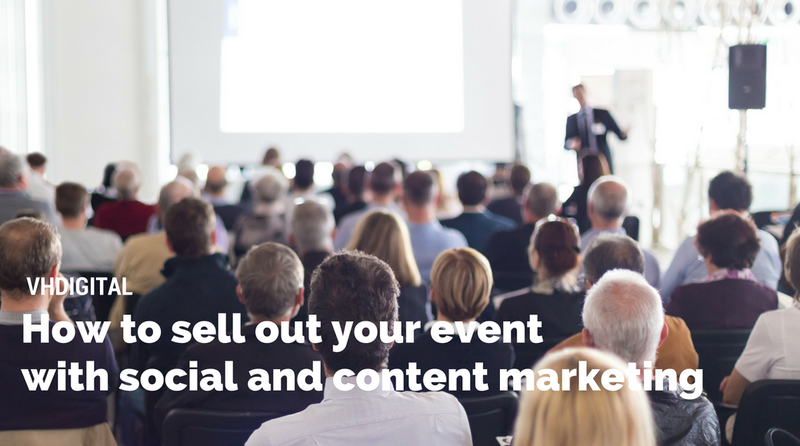 Below are 11 ways on How to sell out your next event with social and content marketing. Hang on to all your email addresses; we are going to do something with them later. List every account each of your partners and speakers has. Then create posts for them and ask them to put the word out. If possible ask your speakers to write a blog post too, then help share it across your accounts. In short, all you are doing is bigging up your speakers or other similar users; it would consist of something like a good video, a quote or a description of each speaker. Once published, tweet at your speakers that you have written a blog post about them. Make sure it sings their praises and makes them look good. The thing with social media account owners is that they love any exposure so will probably share the post with their audience. Over the next few weeks, take part in weekly Twitter chats. These are invaluable in getting your event, and your account, noticed by relevant audiences. Contribute to the conversations don’t just pitch the event. Buffer has some great tips and tricks to help you out plus some handy tools in there to find some chats you can take part in. If you do, try not to be too salesy, maybe make sure your Twitter handle includes the conference. So that every time you chat you are advertising it. Add more descriptions to your bio. Use words that you would want Instagram to index you for. I would also make your link to your site a direct link to a ticket purchase. Then in any of your captions on images add ‘To book tickets click on the link in the bio’ at the same time create an easily rememberable bit.ly link. E.g., bit.ly/myconference and use that in your caption too. On the ticket purchase page, add a link back to the main site and a short description of the event. This way you are removing an extra click but giving a user a reminder what they are buying tickets for. 8.) Provide your partners or sponsors with template content. 9.) Sharing all the content. Right, so we need to make sure that your posts are getting seen in the right conversations everytime you post. This is separate to the twitter chats I mentioned above as they would have their hashtags. First up Twitter: At the most use two hashtags. Think about what sort of conversation you want to be found in. I use Ritetag, it helps you see if a tag is worth it or if there are better connotations. If you click on an individual hashtag and scroll down, you will see even more ideas for tags. It would be worth going through this exercise closer to the event date too as there may some trends you could tap into. This way, when users start commenting, they will hide all those tags from view and it will still be indexed against the tags. Make sense? First, a quick explanation of split testing, in case you aren’t aware of it. When running ads, you always want to know you are putting your money into the most affecting ad. The one that’s driving the sales or whatever target you are trying to achieve. To do this, we want to test variants of images and messaging. So, for each ad format and the targeting method I’m about to tell you I would recommend you source three images and create three call to actions. Then when you create your ads, you mix them up. Image one with message one, then Image one with message two. That clear? If you follow this, you will have nine ads to test. When you add them make sure you include mobile as well. We will not only need to see what ad is working but also where it is working. Also, to note I have not included any video advertising here. All ads will be bought on a cost per click basis so that you only pay if a user clicks. Hopefully, that’s explained the approach; now we will look at the targeting you should use. First, using your email list. In the Facebook business manager you can upload your existing list of subscribers and target them with ads on Facebook, you can also target users that have similar behaviours, exposing you to a new audience. If you are targeting the actual members of the list, consider using an incentive like a discount of 2 for one as these are your loyal customers that attended last year or are already interested. Now, we are going to create some groups based on interests or brands or lifestyle. Also, the ads you create need to apply to this group. So if you are targeting Yoga, make sure the copy you use talks about calmness, meditation or anything that is relative to that group. When you write down, the groups split them, relative to your event of course. Break down your potential attendees, what do they do for a living, what interests to they have, what answers are they looking for and so forth. Create a story about who the perfect attendee would be. The above are just examples but try to break them down, so you start creating more niche groups. Being too broad won’t help. You must install a Facebook pixel on your site for this to work. Be it your blog or one pager. It’s worth it. Now this is where the discount code or incentive comes in. You will now create ads that are speaking to someone that has shown interest but not booked. Using facebook ads we can now retarget these users just offering the discount or incentive. Then hopefully get some more conversions. Now the other cool thing about the facebook pixel is that once a user has purchased and the pixel registers a conversion, we can build another lookalike audience based on users that have purchased. Cool right? I realise there’s a lot here but all of it working together will help get the word out and drive traffic. The end game is to get people to the ticket page. There are other very powerful methods using content, video and click funnels but these deserve their own post. Now go get to work! There are tickets to be sold. Social media and content marketing consultant, founder of vhdigital.co.uk and The Content Blueprint, Lover of Buffalo wings.